Note that behind the lion dancers are large saké barrels, the kinds often found stacked at Shinto shrines. Each unit is marked with the large toshidama motif with the kanji for 'toyo' marked in the center. Toyo is the first part of the name Toyokuni. Those barrels of saké have a religious significance. Made from rice, a commodity which meant both sustenance and wealth, was often donated by breweries to shrines as offerings "showing their gratitude to the deities..."
"In ancient times, Japanese people the shishi was a sacred animal with great power. In shishi kagura, a wooden lion's head (shishigashira) is manipulated in a dance called shishimai (lion's dance). The central purpose of shishimai is to offer prayers to dispel all evil spirits present in a certain area. 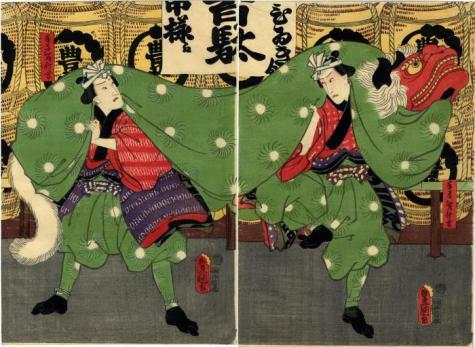 Together with singing and instrumental accompaniment, the dance functions to ward off evil (akuma barai) or prevent destruction by fire (hifuse or hibuse)... Instrumental accompaniment is provided by flutes, drum, and cymbals." Quoted from: Nōmai Dance Drama: A Surviving Spirit of Medieval Japan by Susan Miyo Asai, pp. 34-35.